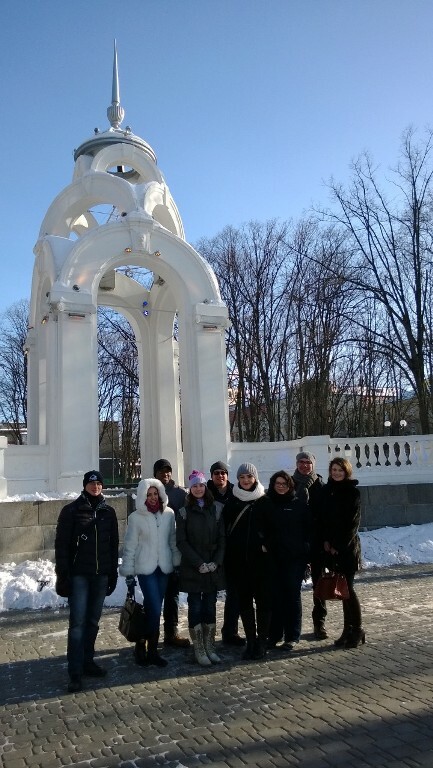 While studying abroad with EESA in Kharkiv, Ukraine, you will want to explore the city and visit places that are interesting, exciting and memorable. There is an almost endless number of entertainment options and cultural activities available to you. Expore all of what Kharkiv has to offer! The “Del Piero” French Comedy Theatre opened on 28 March 2008 with a premiere “Sky Girls, Board the Plane!” (Russian: Девушки неба, - в самолет! ).The theatre was not given its name by chance. The theatre’s Artistic Director Pyotr Nikitin’s love for theatre and fondness for football are reflected in harmony in our logo and the overall conception of the theatre. For, the situation comedy genre is like a ball game! Although Piero is a sad character, on our logo he kicks the ball cheerfully. We aim to give people pleasure, joy and smiles. The French comedy genre is probably the lightest, funniest and happiest. You are welcome to our performance “Sky Girls, Board the Planebased on Marc Camoletti’s “Boeing-Boeing”. Have a good laugh! This theater was founded in 1922 by Les Kurbas as the “Berezil” Theatre, and has glorious traditions. In the mid-1920s, it was one of the most expressive in terms of substance and original in terms of form theatre groups. Today, the theatre’s repertoire includes over twenty productions of classical as well as modern dramatic works. All of the performances at the Shevchenko Theater are in Ukrainian. 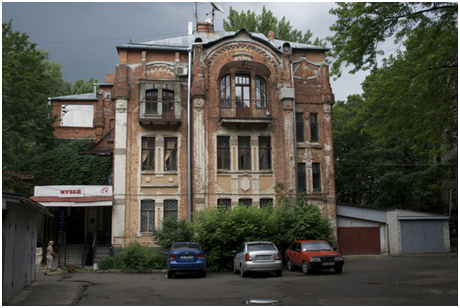 This theater is one of Ukraine’s oldest musical theatres. 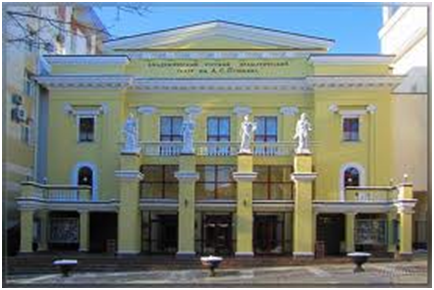 In 1991-1992, the theatre was moved to the new building which is situated on the city’s high street Sumskaya. The astounding hall was especially designed to give classical music and opera lovers the greatest pleasure of listening to both famous and new works played by both popular and young performers. The theatre’s active repertoire is made up of 50 operas and ballets. The fundamentals of today’s repertoire are Russian and Ukrainian classics. 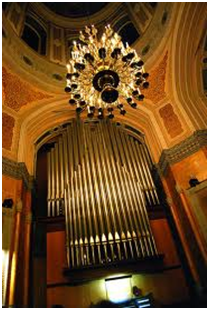 The KhATOB is a renowned and popular concert hall where connections with foreign directors and managers are strengthened. Thus, the KhATOB is confidently entering the international arena. Apart from theatrical productions, Nikolay Osipov and Alexander Solopov’s “Novaya Scena” Theatre Centre of Modern Art also deals with unifying processes, arranges regular master classes in Kharkov, publishes an impressive theatrical magazine as well as organizes and holds theatre festivals. The “Novaya Scena” Theatre is only conservative about one thing – freedom! Carefully thought-out direction, striking character acting, modern drama works, minimalist decorations, pleasing to the eye. Staggeringly well-chosen music not only brims with underlying messages, but also artfully acts as a special character of a play. The “Novaya Scena” is a special state of mind and a unity of soul, body, movement, light and sound. 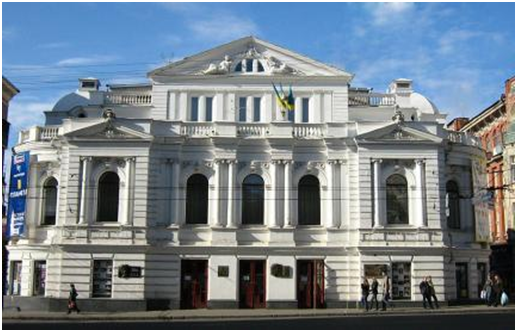 This theater is the oldest operetta theatre in Ukraine created in 1929. The theatre’s first works were experimental productions of “Orpheus in the Underworld” by Offenbach, “A Zaporozhian (Cossack) Beyond the Danube” (also referred to as “Cossacks in Exile”/“Zaporozhets za Dunayem”) by Hulak-Artemovsky and “The Gypsy Baron” by Johann Strauss. 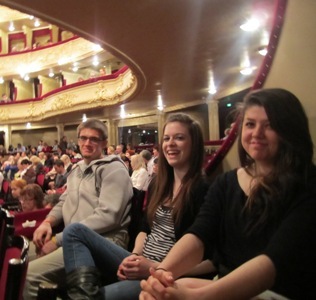 The Kharkov Theatre of Musical Comedy sparkled with stage stars of those days. The theatre experimented with Ukrainian musical repertoire as well as staged world known classical operettas, thereby gaining more prestige and popularity year after year. Nowadays, the Theatre of Musical Comedy’s troupe boasts such experienced talented soloists and true masters of operetta as Honoured Artists Of Ukraine V. Kharitonova, E. Klimchuk, A. Khorokholskaya, V. Poberezhets, actors and vocalists A. Budny, A. Mladov as well as young promising soloists such as I. Vasilyeva, I. Potolova and N. Larkina. The theatre’s ballet troupe is headed by Choreographer, Honoured Art Worker L. Kamyshnikova and Honoured Artist of Ukraine I. Klepikova, whose inexhaustible energy and talent have made the theatre’s ballet a gem of every performance, which thoroughly deserves praise. Kharkov Russian Drama Theater named after Pushkin and was opened in 1933.The purpose of theater is the promotion of Russian realistic art. The first artistic director of the theater was a popular actor Nikolai Petrov of the USSR. This theater is one of the leading theatrical groups of Ukraine, which have been consistently working at their repertoire, their integral actor’s ensemble, their own signature artistic style. Today, the theatre’s repertoire consists of 26 productions. All of the performances are in Russian. 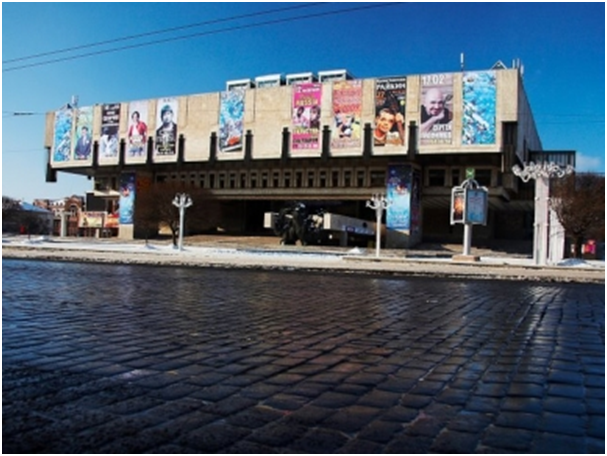 This theater is a fundamentally new phenomenon in Kharkov’s life. Each night spent in this theatre will put you into a marvellous festive mood and make the world look a bit kinder and more sentimental. The theatre’s repertoire is based on Eduard Bezrodny’s original shows, French comedies, works of our city’s art studios, comic shows, musical performances, classics of French film-making and new festival cinema. The Paris Comique is a unique theatre where you can order any food during the performance – from a coffee and cake to a substantial dinner topped off with a glass of Bordeaux. From each ticket or bill, the theatre makes contributions to the Animal Protection Fund. Kharkov Philharmonic Hall, founded in 1929, is one of the oldest concert organizations of Ukraine. The Philharmonic’s building is an architectural landmark, which was once visited by Pyotr Tchaikovsky, Fyodor Shalyapin and many other renowned men of culture. Here, in 1929, the first Ukrainian radio station started its broadcasting. The Philharmonic Hall’s gem is the Academic Symphony Orchestra consisting of about 100 accomplished musicians many of whom are the prize winners of many international and domestic contests. The orchestra’s concertmaster is People’s Artist of Ukraine Igor Shapovalov. The orchestra’s chief conductor is Honoured Art Worker of Ukraine Yuri Yanko. The Museum of Archaeology and Ethnography of Slobodska Ukraine at V.N. Karazin Kharkov National University is almost the same age as the university itself. 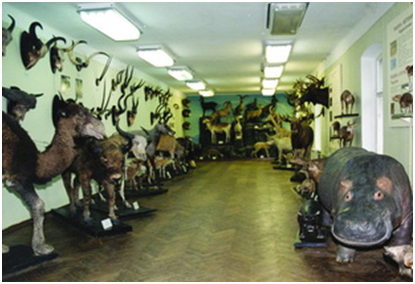 The museum dates back to 1807, when the university created a room of rarities. In the same year, it received artifacts and other antiquities brought over from Olvia and the Province of Voronezh. The Museum’s collection numbers around 10,000 items discovered when studying the relics of Saltovska culture. The collection of Saltovka artifacts stored in the Museum is one of the biggest collections of such kind not only in Ukraine, but around the world. 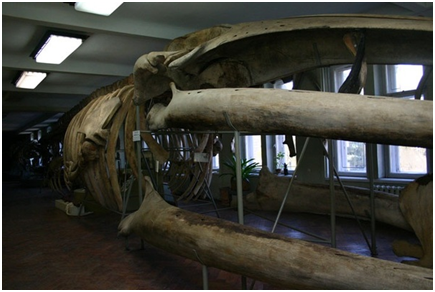 The Museum of Nature was founded in 1807 and is one of the oldest university museums of the world. The museum’s 23 halls (2,000 m2 in area) contain around 250,000 exhibits in such areas of knowledge as the origin of human beings, Darwinism, zoology and geology. The Museum of Nature at V.N. 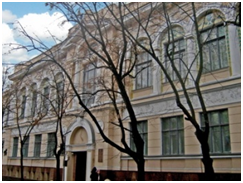 Karazin Kharkov National University is one of the oldest museums of Europe as well as a large scientific and educational centre of Ukraine which organizes exhibitions, executes scientific research, conducts educational activities and promotes scientific and ecological knowledge. Soon after the opening of the Kharkov Imperial University, the Board of Directors urged all school headmasters to send to the university the most remarkable works of art of the region. 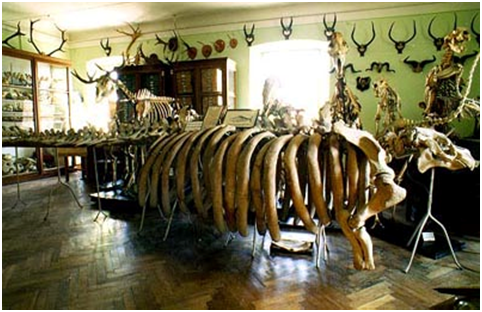 In 1805, Count Severin Pototsky, the trustee of Kharkov Scientific Society, buys the collection of Professor André in Hannover and the collection of an Italian called Cetti, which consisted of many kinds of animals: corals, mollusks, insects, birds as well as fossils and minerals. They arrived in Kharkov on 2 April 1807. At present, the scientific funds comprise over 250,000 exhibits from all around the world. These are stuffed animals and carcasses, skulls, skeletons, birds eggs, wet and dry preparations of various animals, insects, samples of rocks and minerals, fossilized remains and skeletons, wax models, plaster casts of animals that have become extinct. The exhibits are displayed in the form of systematic collections as well as bio-groups and colorful dioramas equipped with audio and visual aids. The museum offers educational activities, holds classes for students, gives consultations to scientific associates and scientists, and organizes temporary exhibitions in nature conservation, mineralogy and paleontology. The Popular Science Museum of World Sexual Cultures features exhibits which represent the sexual cultures of Europe, Africa, America, India, China and Japan from ancient to modern times. The exhibitions of certain halls are dedicated to sexual education of children and adolescents and their preparation for marriage and family life. A special attention is given to the prevention of sexually transmitted diseases, especially AIDS. The museum’s materials are selected in accordance with the requirements of school syllabi. The museum’s history started about ten years ago on the basis of a private collection which belonged to the former director of Sexology and Medical Psychology at the Academy of Continuing Education, Professor Valentin Krishtal. iers and Kharkov’s residents, newspapers, posters and flags of the war period. 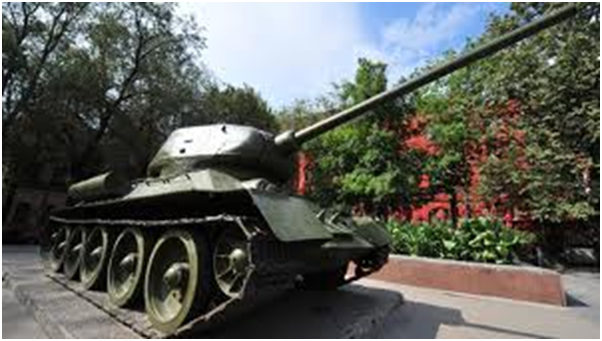 On an open ground outside the museum, you will also see a tank T-34 and four cannons which were used by the Red Army in 1941-1945. 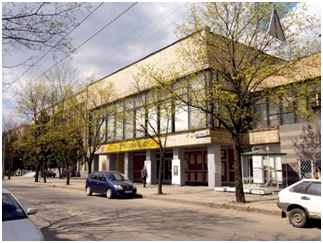 The museum hosts conferences, topical events, lectures and classes in the Studies of Kharkov. Address: 5 Universitetskaya Street, Kharkiv, Ukraine. This museum is the first Holocaust museum in Ukraine. It is based on the materials and documents from the personal archive of L.Volovik. 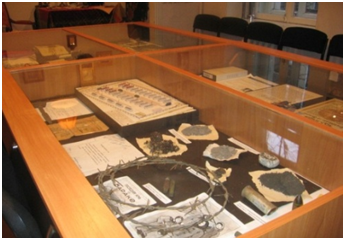 The museum is constantly enriched with documents gathered by the Drobytsky Yar Regional Committee and the Holocaust Kharkov Instructive Centre. Kharkov Museum of Holocaust was opened to the public in December 1996. Over the years of its existence, the museum has been providing guided tours to schoolchildren, students, tourist groups and individual visitors, guests of our city, etc. In the museum, a whole wall is taken up by the photographs of those who perished in during the Holocaust in Kharkiv. These photos were brought to the museum by these people’s relatives, friends, acquaintances, sometimes neighbours. By and large, these are the victims of Kharkov ghetto and Drobytsky Yar. Now the museum is preparing a new exposition – the photographs of those who died in countless ravines of Ukraine, Belarus and Moldova. Address: 28 Petrovskogo Str, Floor 2, Kharkov. This is considered to be one of the most important museums in Ukraine. Founded in 1920, it has been reorganized and renamed several times since then. At first known as the Kharkiv Museum of Church History, it consisted basically of the antiquarian collections of Kharkiv eparchy and Volhynia eparchy and the art collection of Kharkiv University. Its holdings were enriched with precious religious articles that were acquired in the course of registering historical objects belonging to the churches and monasteries of the Kharkiv region. 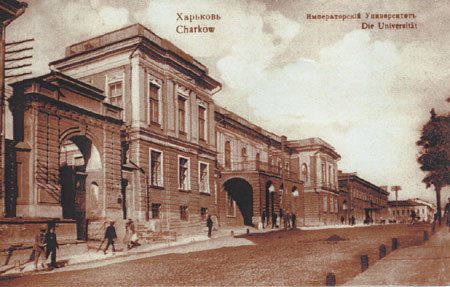 In 1922 the museum was renamed the Kharkiv Museum of Ukrainian Art. It consisted of three departments: architecture, sculpture, and painting. The last encompassed medieval mural paintings, 16th–19th-century icons, portraits, folk paintings, and 19th–20th-century paintings. 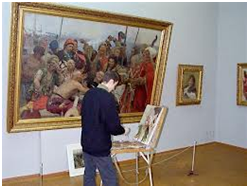 In 1931 the plastic arts collection was separated from the museum to form the National Ukrainian Painting Gallery. During the 1930s the museum was closed to the public. After the war it resumed operations in 1944. From 1949 to 1965 it was known as the Kharkiv State Museum of Fine Art, and since 1965 by its present name. 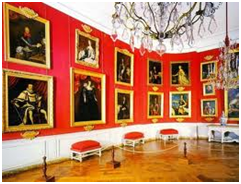 The exhibits, which occupy 25 halls, are divided into five sections: prerevolutionary Ukrainian and Russian art, Soviet art, foreign art (very meager), and decorative and applied art. The works of noted Ukrainian masters such as Volodymyr Borovykovsky, Dmytro H. Levytsky, Antin Losenko, and Ivan Aivazovsky are displayed in the Russian art section. A collection of Serhii Vasylkivsky's works, as well as paintings by Porfyrii Martynovych, Petro Levchenko, Mykhailo Berkos, Dmytro Bezperchy, Mykhailo S. Tkachenko, and Taras Shevchenko (a self-portrait), forms an important part of the Ukrainian art section. A separate hall is devoted to Illia Repin's works, including one version of his famous painting The Zaporozhian Cossacks Writing a Letter to the Sultan. In the Soviet art section, Ukrainian and Russian artists are exhibited side by side, including such noted Ukrainian artists as Mykola Samokysh, Mykola Burachek, Opanas Slastion, Fedir Krychevsky, Oleksander Murashko, Mykhailo Derehus, Ivan Izhakevych, Heorhii Narbut, Mykola Pymonenko, and Tetiana Yablonska. In the 1980s, the museum possessed nearly 20,000 art works. The Kharkiv Art Museum organizes one-man, thematic, and touring exhibitions. The museum building was designed by Oleksii Beketov. An album of the museum with a Ukrainian, Russian, and English text was published in 1983. This kind of museum should have appeared in Ukraine much earlier and much closer to Tchernobyl. But by a quirk of fate, Professor of Kharkov Academy of Arts and Design Oleg Veklenko was the first to put this idea into practice. In May 1986, his name was on the first lists of Tchernobyl Nuclear Power Plant disaster fighters. The disaster was always on his mind, and, on the 5th anniversary of the fatal date, together with other Kharkov disaster fighters Valery Slyota, Sergey Mirny and Vyacheslav Olenin, he organised and held the first international exhibition of posters and graphic works called The 4th Block. The event was so successful (designers from 21 countries of the world submitted works to it) that the artists decided to hold exhibitions like that in Kharkov every three years. Quite recently, the city hosted the 6th triannual exhibition, at which it was ultimately decided to create a museum. The history of Kharkov and Kharkov region and its unique culture are displayed in the exhibited collections of the museum. The Museum of Ceramic Tiles and Bathroom Equipment, which people call the House of Moidodyr (a magical creature from a poem for children by Korney Chukovsky). The name may be interpreted as "Wash'em'clean", or "Clean 'til Holes" literally) or the Museum of Toilet Bowls. The history of the museum started two and a half years ago when a priest brought a brick which turned out to be an antiquity – it was all that was left from a destroyed monastery. Now, the museum boasts the exhibits of Tripolie Culture. However, various pieces of crockery and antiques fail to interest visitors, museum staff admits. The most popular question asked by visitors is: “How did the city make do without bathroom equipment 130 years ago?” The first toilet bowls to appear in the city were decorative. People admired them rather than used. Only very wealthy people could afford to have bathroom equipment. Also, the houses had separate taps for men and women. This museum was founded on April 20th, 1988. The museum’s staff carries out scientific research and educative activities trying to recreate the literary history of Slobozhanschina. The museum’s collection comprises over 30,000 exhibits, including unique manuscripts, photographs, documents, autographs and personal belongings of M. Khvylyovy, V.Svidzinsky, M.Kulish, P.Tychina, V.Mysyk, T.Khotkevih, M.Yogansen and many other men of culture. Based on these exhibits, the museum has created dozens of exhibitions which received a high appraisal in Ukraine and abroad. Opening Hours: from 9.00 to 18.00, closed on Monday and Tuesday. Museum of Southern Railway’s History. The staff of the Southern Railway has always tried to treasure the memory of the past. Therefore, many of its branches have their own museums, halls of fame and memorial plaques, where they have been trying to put together history little by little. However, the main concentration of Southern Railway’s History is the Museum of Southern Railway situated in the building of the former Zheleznodorozhnik House of Culture, now the Central House of Science and Technology. The museum features historical materials from all corners of the Southern Railway connected with different periods of its activity. Today, the collection numbers more than 2,000 exhibits, many of which have not only historical, but also educational value. The exposition tells the story of life and art of the great pop singer Claudia Shulzhenko (1906–1984) who was born in kharkiv. In order to enter the museum you need to make an appointment. It is situated in an ordinary apartment of a residential building. The exposition is dedicated to the life and activity of the aviation pioneer S. Hryzodubov and his daughter, Hero of the Soviet Union V. Hryzodubova. The museum also tells the history of aviation development and space exploration research in Kharkiv. Monument to Taras Shevchenko was erected on March, 24, 1935 unveiling of the monument to the great son of the Ukrainian people Taras Shevchenko (1814 - 1861), the revolutionary-democrat, the ardent fighter against tsarizm and serfdom. The monument is situated at the entrance to a park which is also given the name Sehevchenko Park. It’s considered the best among more than 250 monuments to Taras Shevchenko in the world. It took more than a year to create a work of art. 16.5-meter-high monument is a bronze statue of Shevchenko (5.5 meters), standing on a round pedestal of natural silicate. 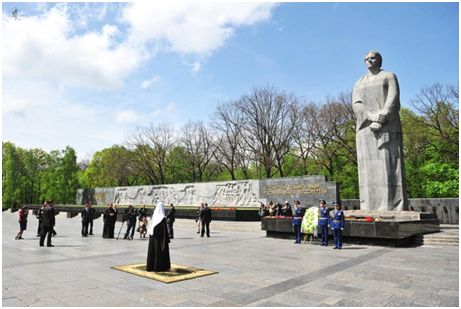 The statue is surrounded by 16 smaller pedestals with statues made ​​of bronze, as those characters from the history of Ukraine and the heroes of Taras Shevchenko are selected. Taras Shevchenko came from serf peasants and was deeply linked with the people by the ardent word of a poet, by a sharp pencil of an artist expressed their thoughts and feelings, defended their interests. T.Shevchenko's works were loved by the people of different nationalities who inhabited our country. His main poetry collection book was titled "Kobzar". It means "the folk singer of ukrainian ballads". Very many kobzars were singing for many centuries about hard life of people of Ukraine and expressed their dreams about liberty. This book became the favorite one for all Ukrainians and the poet was named Kobzar after it. Now our Kobzar has been translated into dozens of foreign languages. The autocratic government of tsarist Russia made everything possible to erase T.Shevchenko's name from people's memory, suppressed all attempts to immortalize in sculpture the image of the poet of genius. In 1860 the tsar personally prohibited the disposing of Shevchenko's bas-relief at the monument "Russia's Millennium" to famous Russian sculptor M.O.Mikeshin. Tsarist satraps frustrated the subscription organized through the whole of Russia to raise funds for erecting a monument to the poet in 1891. In spite of that, several first sculpture portraits of T.Shevchenko were created at the end of his life and soon after his death. Among those that we have extinct today is a sculpture portrait of Taras Grigoryevich created by M.S.Pimenov when Shevchenko was sitting to him. A classical representation of the poet - naked bust positioned on a rectangular basis - was created in 1862 by a well known Russian sculptor F.F.Kamensky. Between 60's and 70's the Ukrainian sculptor P.P.Zabila created marble and bronze busts of T.G.Shevchenko. The first monument in the country, the bust in marble, to the great Kobzar was set up illegally in 1899 in Kharkov. It was situated in the garden near the house of Alchevskaya, who was the famous progressive benefactress, the founder of female Sunday school for adults. Its author was the kharkivite, a prominent Russian sculptor, professor of the St-Petersburg Academy of Arts V.A.Beklemishev. The students often gathered at this monument, poets-beginners recited their poetry here full of faith in the bright future of the people. In 1901 on the eve of the 40-th anniversary since T.Shevchenko's death the bust was removed by the "imperial instructions": the government was afraid of people's riot. To the centenary since the poet's birth the progressive public of Russia organized the raising of money for the monument to T.Shevchenko in Kiev. This event became a matter of nationwide character. From 1909 to 1914 four competitions for the best project of a monument with participation of many well-known Russian sculptors were held. But the monument was not erected. A wave of indignation ran over the country. The more the reaction raged, the more actively the people asserted its rights to the memory of a beloved poet. Unknown craftsmen carved his portraits on the rocks, skilled hands of embroideresses adorned towels with Kobzar's images, folk singers and musicians made songs about T.Shevchenko, composed music to his verses. After the October revolution motioned by Lenin the Soviet government issued the decree about monuments. In accordance with this decree there had to be erected monuments to well known revolutionaries, scientists and people of arts, among which was the Ukrainian poet, democratic revolutionary T. G. Shevchenko. After the collapse of USSR many statues were torn down. This one survives in the city center. 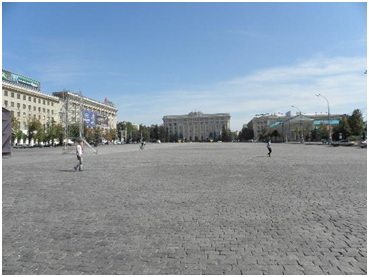 It is on Freedom Square, which is one of the biggest squares in Europe, once also an air strip in WWII. 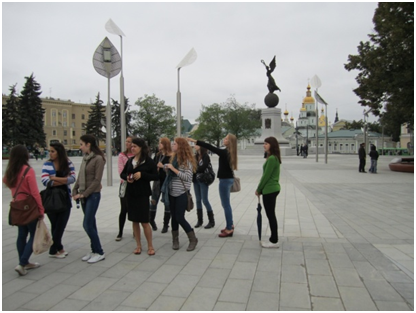 People come here to meet, study at Karazin University which is located on the square as well. 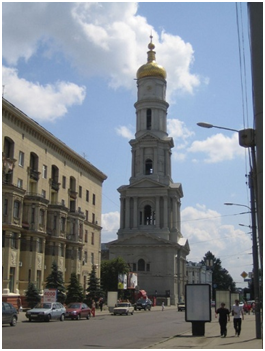 It is a landmark of Kharkov. In Kharkov, in the Forest Park in 1977 there was opened a beautiful and majestic memorial complex. The Complex of Glory immortalized the immortal and unforgettable feat of Soviet citizens in the fight against the Nazi invaders. The place for the memorial was chosen not accidental: at this northern city limit the Nazis executed and shot tens of thousands of Soviet soldiers, partisans and underground fighters, prisoners of war and patriots, who refused to submit to the enemy. 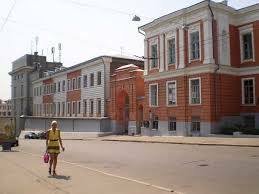 Citizens of Kharkov adore the works of Ilf and Petrov like no other Ukrainian city. There are 4 monuments to characters of their famous books in Kharkov. In August 2001 a monument to Father Fyodor was installed at the first platform of Southern station in Kharkov. The idea belongs to Konstantin Gevorkyan, the director of the “First capital” channel. The monument was unveiled at a ceremony that featured a small theatrical performance starring famous characters from the book: Ostap Bender and Ippolit Vorobyaninov. The monument depicts Father Fyodor walking with an envelope in one hand and a teapot in the other. The statue is made of bronze and stands on a marble pedestal. The second monument is situated in Petrovskogo street. It is a monument to Kisa Vorobyaninov and was inspired by the actor Anatoly Papanov. The monument was unveiled in December 2003, and the creation of the monument was funded by the owner of “Rio” café Azar Akhmediev. The monument, which is situated outside the above mentiond café, is made of bronze and stands on a marble pedestal. The character, Kisa Vorobyaninov, asks the visitors for money with his hat that he holds in one hand, while holding a leather briefcase with a big penetrating hole in it. Two years later the third monument to a character of the book called Ostap Bender appeared. 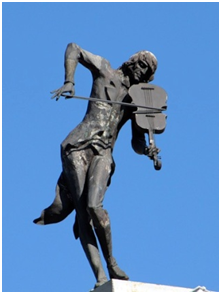 The monument was created by sculptor Eldeniz Gurbanov and was based on the image of Sergey Yurski, the actor. The creation was once again funded by A. Akhmediev, as the new monument was an addition to the collection of sculptures that is being gathered in the courtyard of “Rio” café. 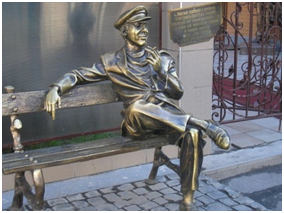 Ostap Bender is made of bronze and is depicted smoking a cigarette while sitting on a bench. Since the character has always wanted to visit Rio de Janeiro, the placement of the monument seems very appropriate. Citizens of Kharkov adore the works of Ilf and Petrov like no other Ukrainian city. 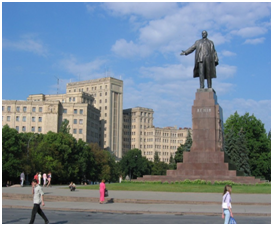 There are 4 monuments to characters of their famous books in Kharkov. 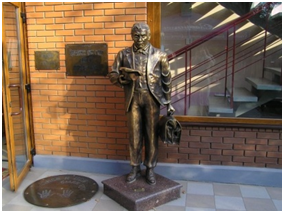 In August 2001 a monument to Father Fyodor was installed at the first platform of Southern station in Kharkov. The idea belongs to Konstantin Gevorkyan, the director of the “First capital” channel. The monument was unveiled at a ceremony that featured a small theatrical performance starring famous characters from the book: Ostap Bender and Ippolit Vorobyaninov. The monument depicts Father Fyodor walking with an envelope in one hand and a teapot in the other. The statue is made of bronze and stands on a marble pedestal. The latest creation by Eldaniz Gurbanov is a monument to Ellochka the ogress. It was placed outside “Rio” café in spring of 2006. The character is made of bronze and is depicted standing nonchalantly by a chair that might contain some diamonds, and that is the best way to depict Ellochka. The figure looks even more charming with a boa made of Mexican jerboa, which turned out to be a dyed rabbit’s fur. The sculptor based the statue on the image of actress E. Shanina. 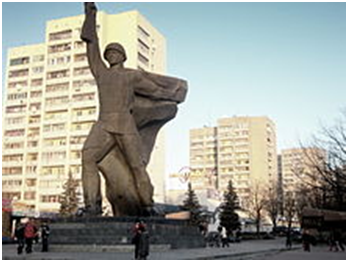 It is very likely that new items will be added to the collection of statues, as Kharkov citizens and guests have very warm feelings for this place. According to legend, a monument to Cossack Kharko was built in honor of the founder of the city of Kharkov. The sculpture was installed in the middle of the roadway at the beginning of the Lenin Avenue in August 2004. The monument depicts a Cossack with a spear seating astride a horse. Before the opening of the monument Kharkov citizens tried to guess in what direction will the monument be turned – toward the rom building with the Regional Administration Offices, or towards the city. Finally, the monument was located facing the Derzhprom. This bronze statue was presented to Kharkov citizens by the famous Russian sculptor Zurab Tsereteli. 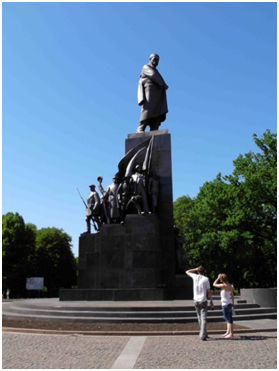 The official name of the monument is "To the founders of Kharkov in honor of the 350th Anniversary of the City." On the 7-meter pedestal there is a statue of the Cossack seated astride a horse. Precisely-built horse features gigantomania, which is inherent to Zurab Tsereteli. 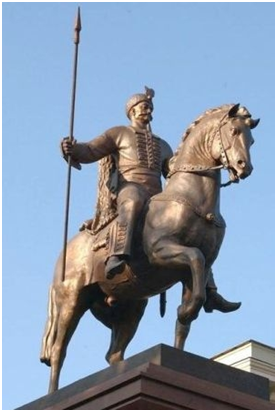 The 7-meter bronze statue of the Cossack Kharko weighs 12 tonn. According to Tsereteli, he spent 6 months on the sculpture that is so important for the citizens of Kharkov. 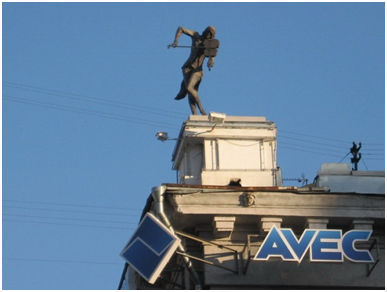 In 2003 the building of the former Azov-Don bank was decorated with a “ fiddler on the roof” figure ( sculptured by Gurbanov) It was presented to the city by the president of charitable foundation AVEK – Alexandr Feldman as the sign of appreciation and respect to all creative people of the city. It is no coincidence that this figure is situated on the roof. To see it you need to raise the head, it symbolizes art and creative work. 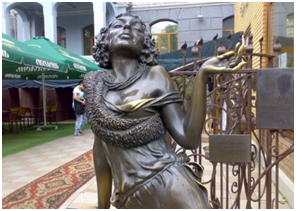 In April 2003, a bronze monument to the kissing lovers was opened near Kharkov metro station "Architektora Beketova". The monument was designed by a young sculptor Dmitro Ivanchenko in abstract style, which became a cause of controversial attitude to a new sculpture among the citizens: conservatives called the monument "Kamasutra from Auschwitz", while the supportive part of Kharkov were excited to join the tradition of kissing near the monument. In 2009, the city authorities decided to modernize a territory around the monument, and built a fountain with a night light, installed benches and lanterns, laid down the alleys. 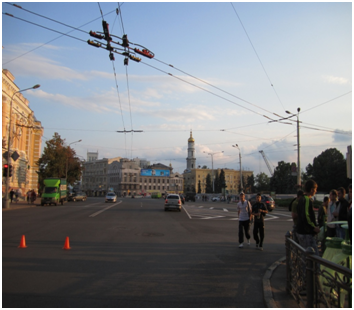 On August 23, 2009, on the Day of the Kharkov city, at the intersection of Pushkinska and Sovnarkomivska streets a new Square of Architects was opened. According to the authorities’ project, the square was designed as a place for seven wonders of the city - the miniatures of the best Kharkov buildings, according to the opinion of local citizens. Dzerkalna Struna Complex, Cathedral of the Annunciation, the house with a steeple and Pokrovsky Cathedral. Due to the slow works of masters, who did not manage to finish the construction of monuments by the opening ceremony, only one of seven miniatures - a monument to the writer Taras Shevchenko was opened in time. The construction of the city "miracles" was continued by Seifaddin Gurbanov, and owing to his efforts all seven models made of white marble were opened on the next Day of the Kharkov city in 2010. 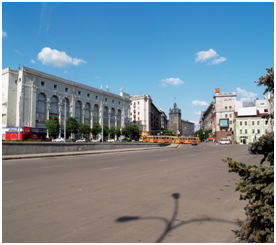 Kharkov Freedom Square is the second largest city square in Europe and the 9th in the World. This place hosts all the main city concerts and shows. During winter there is a skating rink, an Ice city and central Christmas tree. The Square is surrounded by other attractions: DerzhProm building, Karazin National University , Shevchenko Park, monument to V.Lenin, City Hall. Freedom Square total area is 11.9 hectares which means it’s bigger than Moscow Red Square. Constitution Square in Kharkov is the central and the oldest square in the city, which was founded in 1659 simultaneously with the erection of the Kharkov prison. The Constitution Square has changed a lot of names for more than 3 centuries of its existence: Fair Square since XVII to XIX century, Nicholas or Nikolskaya Square until January 1919 and from June until the end of 1919, the M.S. Teveleva Square from January to June 1919 and from 1920 to 1975, the Square of Soviet Ukraine from 1975 until the second half of 1990 and the Constitution Square from 1996. The length of the constitution square is 550 m, its width varies from 45 to 120 m. The square is worldwide known not only for its historical value, but also because of the huge number of the attractions, located on it. Some of them have not survived to our days. Some attractions includes the Puppet Theatre, the dwelling house with a spire, Palace of Labor, the City Council, a favorite meeting place for Kharkov citizens - Thermometer hanging on the “House under thermometer”, and many other spectacular views. However, in addition to the attractions, the Constitution Square is also interesting for some historical events. 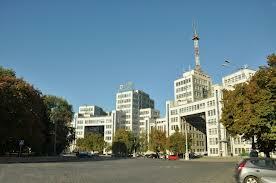 The first Pioneer Palace in the Soviet Union and in the world was opened in Kharkov on this square on Sept. 6, 1935. Here, in the same year there was carried out the first New Year Tree in the former Soviet Union, due to which there appeared the phrase that children are the only privileged class in the country. Rosa Luxemburg Square was founded in Kharkov in the second half of 17th century. Since that time it had different names - Lobnaia, Narodnaia, Torgovaia and Pavlovskaia. The square was a place where the Uspenska and Pokrovska Fairs, as well as the main market of the city were located. There was a milestone that indicated the distance from Kharkov to other Ukrainian cities. 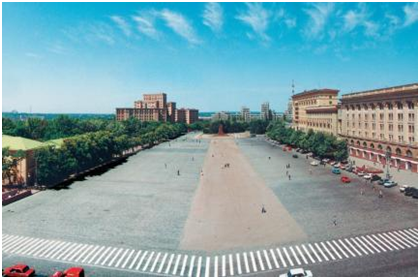 The square played a role of "business center" of the pre-revolutionary and Soviet Kharkov. The present name of the square was given to it in 1919 to commemorate Rosa Luxemburg, one of the founders of the German Communist Party. In 2001 a monument was erected on the square to commemorate the 10th anniversary of Ukraine’s independence. It is a triumphal column crowned by a bronze falcon — the symbol of liberty; a ten-year-old girl standing at the foot of the column is an allegory of a young country. The Derzhprom building is located in Freedom Square between the two main buildings of Karazin University. Its name is an abbreviation of two words that, taken together, mean State Industry. The building was one of a few showcase projects designed when Kharkiv was the capital of the Ukrainian SSR. It was to become the tallest structure in Europe for its time. The building also became the most spacious single structure in the world by the year of its completion in 1928 to be surpassed by New York's skyscrapers in 1930s. Its unique feature lies in the symmetry which can only be felt at one point, in the centre of the square. The use of concrete in its construction and the system of overhead walkways and individual interlinked towers made it extremely innovative. It was rated by Reyner Banham as one of the major architectural achievements of the 1920s in his Theory and Design in the First Machine Age and comparable in scale only to the Dessau Bauhaus and the Van Nelle factory in Rotterdam. This allowed the structure to fully survive any destruction attempts during the Second World War. 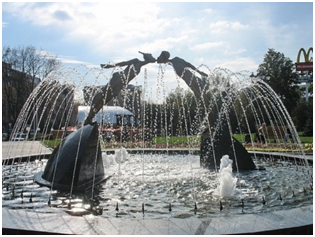 This arbor and fountain is located on Sums'ka street in the Victory park in front of Kharkiv National Academic Opera and Ballet Theatre and is considered as the one of the symbols of Kharkiv. The Mirror Stream was built in 1947 in honor of the Victory in World War II. Behind the fountain there is a small yet effective park which is very pleasant to walk in, sit on its benches, have a date or a business meeting. Now it is surrounded by small picturesque public garden, there is a pavilion from under which a mirror stream is flowing. In front of the fountain there is a beautiful ground with a flower bed, and behind it you will find romantic pond of irregular shape. The Mirror Stream is one of the most favorite places of kharkovians to meet and rest, and on Fridays and Saturdays this is where newlyweds come to take wedding pictures. V.N. Karazin Kharkiv National University is one of the oldest universities in Eastern Europe. It was founded in November 1804, on the initiative of the prominent educator V.N. Karazin and in accordance with the charter of Tsar Alexander I. The opening ceremony was held on January 29, 1805. The University made an important contribution to the Ukrainian national renaissance of the XIX-XXth centuries. It gave a powerful impetus to the emergence of Kharkiv as a major scientific and cultural center and an academic hub of Ukraine. Today the University justly rates among the best Ukrainian classical universities and is known in many countries.